See there is a stigma around homeless people that has been around. Not sure who started this theory/rumour/half-true fact, but the truth remains that some people reckon that homeless people on the whole are homeless due to things that happened in their lives that they could control. Meaning that these homeless people can actually get out of the cycle of homelessness and therefore don’t need money or any handouts because they can do something about it if they really wanted to. Not sure how true this somewhat crazy notion is, if it even is true at all, but society usually doesn’t help homeless people. Not out of the goodness of their own heart, and certainly not if they’re cornered and surrounded by a ‘homeless’ person about to give a speech on why they’re homeless. As for this bunch of people sitting in the train carriage I was in; they were looking all embarrassed for some reason, looking down at their phones, and not giving this person the time of day. Now in hindsight I thought that was a bit rude, but mind you I was doing the same thing. How hypocritical, right? Now I know what you’re thinking- this guy may not have been legit. You’re probably right. The fact that he was dressed somewhat nicely, coupled with the fact that he spoke of semi-intelligence, raised alarms for me. He wasn’t drunk, didn’t have a big beard, didn’t sway from side to side, and from the little bit of time I heard him speak, looked like he didn’t have any mental or psychological issues. He walked down the aisle after giving his ‘testimony’ of being homeless (which to me sounded possibly rehearsed!) and stood for quite a long time in front of each group of people hoping to receive money. And when he didn’t receive anything from anyone, he proceeded onto the next carriage. Is it possible that we just witnessed a conman in work? Maybe… but one thing is for sure- if it was the real thing and that person was homeless, I think someone should have done something- as in helped him out. In fact, all of our reactions that day proved that we’re more selfish that we originally think. Now I can’t speak for the rest of the people on the carriage. Maybe they never gave the guy a second thought after he moved on and tried to ‘heckle’ or ‘solicit’ others. Then again maybe they did. All I know is how this guy affected me a little bit in the days after. Because I thought about him and people like him, and whether we as Christians are equipped or even willing to help, or even love those who are different than ourselves. This goes for more than just homeless people. See, I’ve thought about this for a while now, and I’ve concluded that we hang out in our cliques, with people who think similar to us, and that’s it. Sedentary in our lifestyle, we probably do not want to talk to nor even be associated with people with a different viewpoint. ‘Because they don’t think like us, how could we ever get along? How could we even be friends?’ is what we all could think; but Jesus calls us to love everyone, with no condition, just like our Father in Heaven loves each of us; even the least of these and even those who cheat us and who betray us. Yes, God calls us to love our enemies. What? Say what? ‘But he’s unlovable! He’s a drunk, he’s a sexual deviant, he’s gay, he’s prideful, he gossips, he isn’t that nice to hang around with, he challenges me in my way of thinking, he’s just not like me…’ But God still calls us to love them. Love them where they are at. Show them Jesus where they are at. Don’t do anything to enable their behaviour that may cause destruction to themselves and those around them- but instead love them unconditionally no matter who they are and no matter what they’ve done. Even if we’re not getting anything in return, or if we’re in fact being played. The fact that we’re faithful to the call of loving the hardest people to love, with a love that is everlasting- will pay dividends and rewards in the end. Not that we should ever love others so that God can reward us later- that’s not the point of it all. But rather- and this is directed to me as well as we’re all culpable- we should love as an outpouring of what Christ has done. There’s an album that I’ve been drawn to of later. 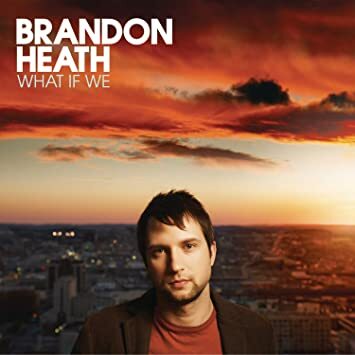 Brandon Heath’s What If We is a stellar sophomore album from 2008, that essentially and basically asks the question of what would we do if faced with an uncomfortable situation. If we knew that the gospel was true and that Jesus has set us free- we’d want to share it with everybody in any way that we could, in any way that would be suitable to the person in question. Songs like “Love Never Fails” and “No Not One” highlight the fact that Jesus’ love never fails (and by extension ours shouldn’t fail either! ), and that there’s no one greater whom we can praise; respectively. While it is the first single “Give Me Your Eyes” that really grabs my attention. With it’s picturesque music video really honing in on the fact that we really need to take an active stand at injustice towards others different than ourselves, or that we need to help a broken world, and especially others who need it, no matter if their basic moral code and values are different from our own; I felt that God was asking me ‘what would you do if the guy was legit and he really needed help?’. The correct answer I reckon would be to help him (I’m not really sure how!) but I know I still wouldn’t. Not because I wouldn’t want to, but maybe because I didn’t, and still don’t know how to. Knowing what to do in that situation I reckon, requires another blog post in and of itself. And that’s ok. We’re still living in a world of me, me, me in this digital age- but at least knowing that there are things that need to be done to make this world a better place, is the first step in a journey that needs to be taken. No matter how long it takes. Is there something that God is opening your eyes to, that you can actively make a difference? If not, maybe we can turn off our phones, our social media, just for a bit; and ask God to speak. You may be surprised at what He says.